Hayling Island Labs - After Hours: They don't make anything to last any more ..
My precious Cambridge P60 amp died at the weekend, but fortunately it died in a way that was quite familiar. There was a sudden buzz coming from both speakers (so it's something common to both amps) .. a drone at 100Hz (so you know it is something connected to the power supply, after the rectifier), unaffected by volume controls, tone controls, balance (so it's not the pre-amp) .. signal still sounds through the hum (so it's not a catastrophic failure of the power transistors) .. ah. The smoothing capacitors have gone to Silicon Heaven. Maplins are open on a Sunday, so Wifey and I popped in on our way somewhere else, and I bought myself some very nice looking 4700uF 63v electrolytics. All this before taking the amp apart; that is confidence for you. 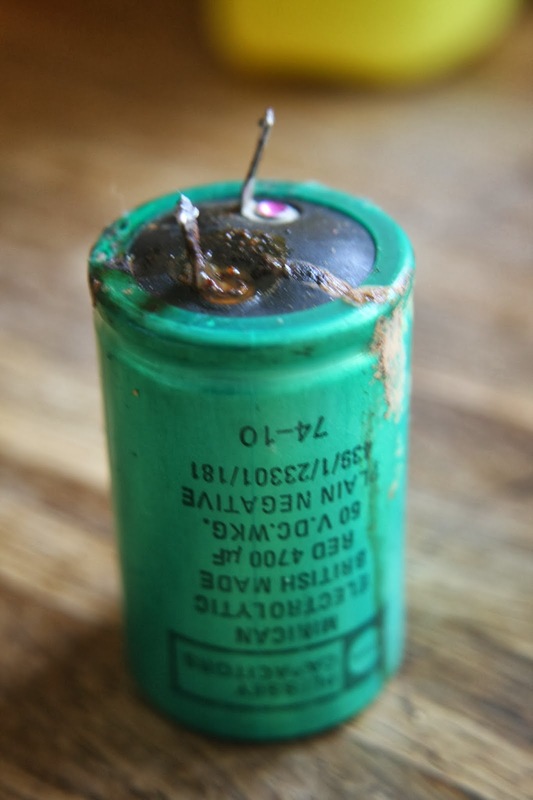 Fortunately (and as Virgil wrote, audentes fortuna iuvat - fortune favours the reckless) when I did take it apart, I found some lovely 1970s vintage Plessey capacitors in there, and one had decided to pop. And leak. And make a huge mess. I can't really complain about their needing replacing after only 40 years. Now if someone could tell me how to get the front panel re-printed .. mind you it is scarcely a stock P60; the power switch has failed so the line cord is wired direct, and I don't like DIN speaker sockets, so a quad of 4mm sockets is wired onto a small board dangling out the back. It still sounds magnificent, when driving a pair of Kef Concerto speakers of a similar vintage. The set-up sounds particularly good when playing electronic music.